This CELIAS/MTOF spectrum was accumulated over a three day period (these valuesare uncorrected for efficiencies). The MTOF sensor was set in a mode that was optimized for observing solar wind species with masses above that of sulfur. This is why the peaks for Calcium (mass 40) and Iron (mass 56) are so dominant compared to, for example, Oxygen. 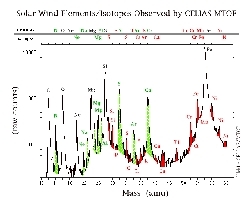 In this color version of the figure, the peaks that are simply linedrawn are the elements commonly observed by insitu solar wind experiments: Carbon (mass 12 amu), Oxygen (mass 16 amu), Neon (mass 20), Magnesium (mass 24), Silicon (mass 28), and Iron (mass 56). 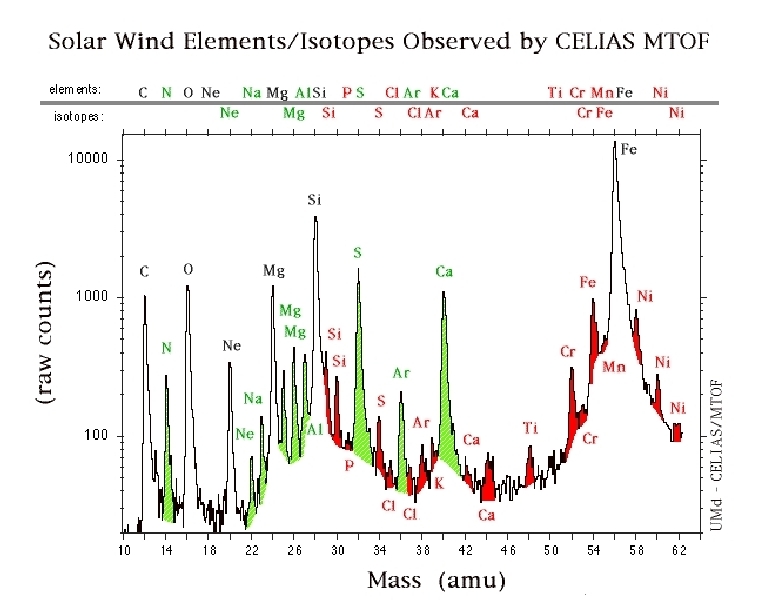 The elements and isotopes for which SOHO MTOF has given the first in situ spacecraft solar wind observations are in red. These include the Silicon isotopes (masses 29, 30), the element Phosphorus (mass 31), a Sulfur isotope (mass 34), the element Chlorine (mass 35) and its isotope (mass 37), an Argon isotope (mass 38), the Calcium isotopes (masses 42 and 44), the element Titanium (mass 48), the element Chromium (mass 52) and its isotope (mass 53), the Iron isotope (mass 54, there is also a shoulder for mass 57), the element Manganese (mass 55), the element Nickel (mass 58) and its isotopes (masses 60, 62). [For all but Argon 38, these are the first in situ solar wind observations by any means. There was a measurement of Argon 38 in the Apollo foil experiments, but it had a large uncertainty, and is not frequently quoted by the foil experimenters themselves for solar wind abundance measurements.] 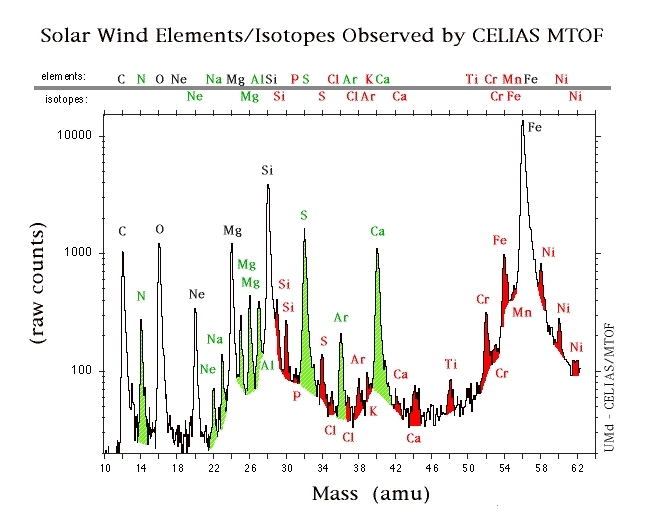 The elements and isotopes that are shaded green are not observed routinely by conventional solar wind experiments. These include the element Nitrogen (mass 14), a Neon isotope (mass 22), the element Sodium (mass 23), the Magnesium isotopes (masses 25, 26), the element Aluminum (mass 27), the Sulfur element (mass 32), the Argon element (mass 36), and the Calcium element (mass 40). Measurements for Sulfur 32 have been made with the Ulysses SWICS experiment, by accumulating over several months of data, and using extensive fitting techniques (it is not really resolved from Iron and Magnesium). Neon 22 and Argon 36 were measured by the Apollo foil experiments. The remainder were first observed in the in situ solar wind by the MTOF prototype sensor, which was launched on WIND about 13 months before SOHO. However, MTOF has a major advantage over its prototype regarding temporal resolution, because of its higher collection power.